I’m DJ-ing the nineties theme for the stadium. Is this your first time at the Union? No. This my probably my fifth time. So you started this season. Yeah, well, I’m actually doing it for another DJ when he is not able to. You’re the back up dj. What do you think of the crowd today. Oh they were great. Especially today with the nineties theme with Alex volunteering to get slimed. It’s after seven o’clock he can go but he is still asking people to slime him! What’s your relationship with soccer? […] None. 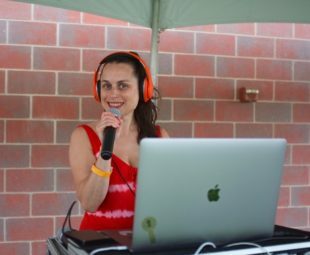 DJ-ing the stadium? And I watch sometimes? Are you able to go inside and watch the game? I do. Typically we DJ here for about two hours then we go upstairs into the suites, hang out until after the game, and then we play for about an hour. Like an afterparty. Wait, where is the after party? Yeah, for just an hour. Soccer? […] Every time I’m here they win! No. I got time for DJ-ing and that’s about it. I’m from Atco, New Jersey. Where else do you DJ? Everywhere. I don’t always do events like this. I normally do private parties, weddings, birthday parties, any kind of party. I’m booked pretty much every weekend. How do you get the crowds going here? I just be myself and extend my energy out and they usually respond well. Are you playing any soccer tunes? Do you know of any soccer tunes? Are you going to play soccer tunes next time? If you give me a list!